This year, as part of our work as a local player development centre for the LTA and British Tennis, our team is going on the road to visit Reception, Yr 1, Yr 2 and Yr 3 students in all our local primary schools. Each and every child will have the chance to take part in a free 30-minute session at their school, and they will then be invited to attend our open days on the Saturday and Sunday of the same week, where we will be holding 2 free sessions each day at Halton Tennis Centre. Our BHAG (Big Hairy Audacious Goal!!) is to see 1,000 children at their schools during the week leading up to our open days in March. We'll then hope to see as many of them as we can coming to see us at the weekend -- and taking part in a further session, familiarising themselves with the club and our team. 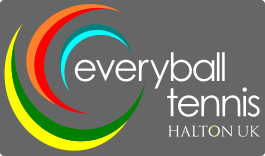 Mike James, Director of Tennis for Everyball, says, "We are very much looking forward to seeing each and every child at our partner primaries and exposing them to this great game of tennis. We want to capture their enthusiasm and curiosity -- curiosity being the healthiest place of all learning! -- and give them every opportunity to see our facilities, meet the coaches, and learn about the programs we have on offer." If your child currently attends a school with which Everyball does not have a partnership and which has no tennis provision, we would love to hear from you to see how we can help get your school involved. Simply email james@everyball.net to find out more.